That didn’t take long. 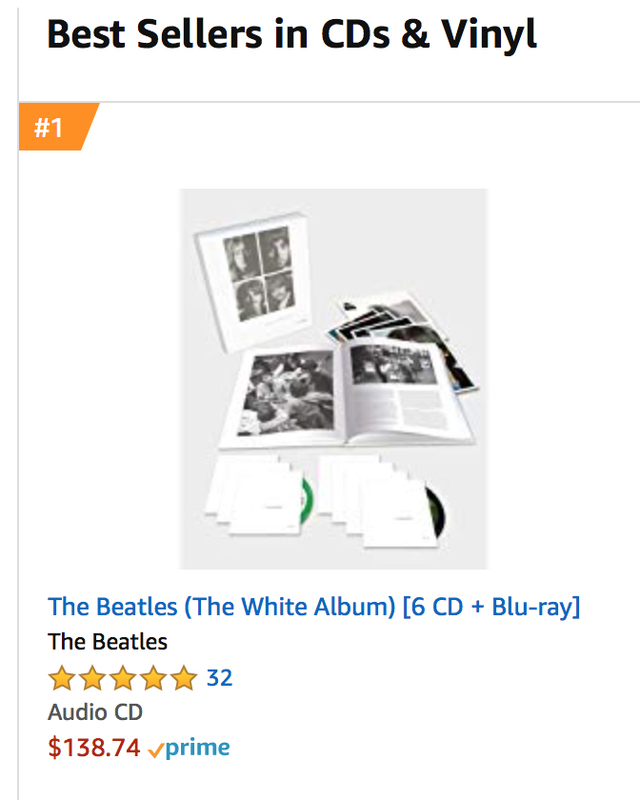 One day after the November 9 release of the eagerly awaited 50th Anniversary expanded editions of The BEATLES (White Album), via Apple Corps Ltd./Capitol/UMe, the 7-disc Super Deluxe edition vaulted to the #1 spot on Amazon in the U.S. 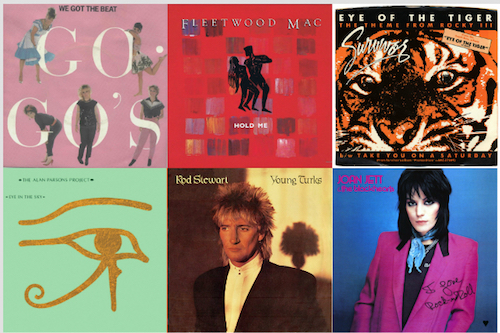 In addition, the modestly priced 3-CD edition was at #1 in the U.K. and #3 in the U.S. A 4-LP edition was at #11 in the U.S. The BEATLES (White Album) was the first Beatles album to be released on the group’s own Apple Records label, in 1968. 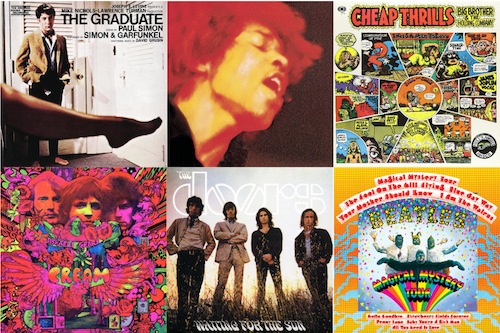 Issued in both stereo and mono for the U.K. and in stereo for the U.S., the double album was an immediate bestseller, entering the British chart at #1 and remaining there for eight of the 22 weeks it was listed. The White Album also debuted at #1 in the U.S., holding the top spot for nine weeks of its initial 65-week chart run. 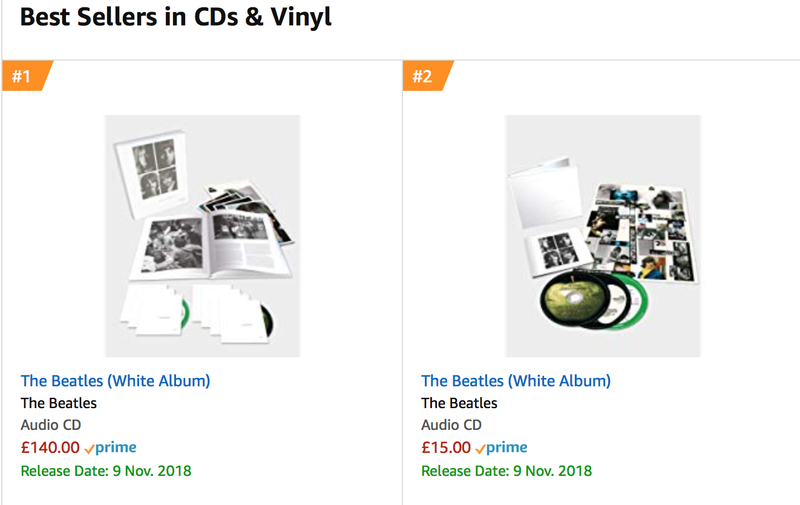 Hours after the initial September 24 announcement, the Super Deluxe edition, despite a not-insignificant price, was #1 in both the U.S. and U.K. on Amazon’s best sellers chart. 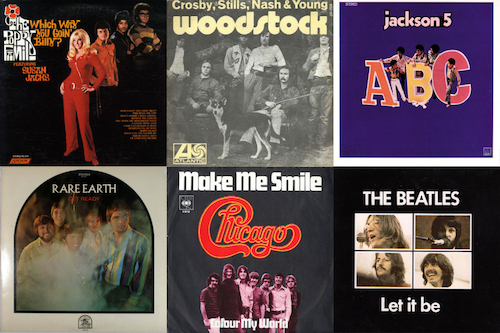 The 4-LP edition was #5 in the U.S and #6 in the U.K. 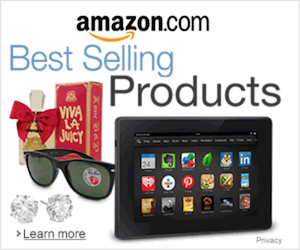 The modestly priced 3-CD version was #2 in the U.K. At that time, he releases were joined near the top of Amazon’s U.S. chart by Paul McCartney’s new Egypt Station album at #8 and the Deluxe 6-disc edition of the John Lennon Imagine Ultimate Collection at #25. McCartney’s album, which benefitted from an outstanding promotional campaign, debuted at #1 on Billboard in its first week of release. 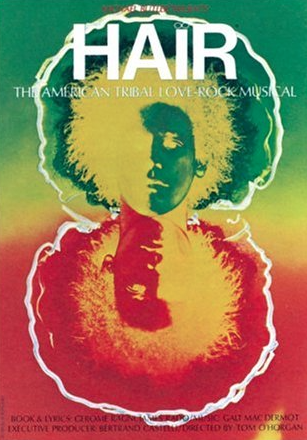 The Deluxe 3-CD is presented in an embossed digipak with the fold-out poster and portrait photos, plus a 24-page booklet abridged from the Super Deluxe book. Presented in a lift-top box with a four-page booklet, the limited edition Deluxe 4-LP vinyl set presents the 2-LP album in a faithful, embossed reproduction of its original gatefold sleeve with the fold-out poster and portrait photos, paired with the 2-LP Esher demos in an embossed gatefold sleeve.